Clip In O.E. style electric heated replacement door mirror glass with integral plastic base plate for the Alfa Romeo Mito [2006 onwards]. Clips into the mirror housing as original. [Heated Version]. Clip In O.E. style electric heated and tinted replacement door mirror glass with integral plastic base plate for the Alfa Romeo Mito [2006 onwards]. Clips into the mirror housing as original. [Heated Version]. 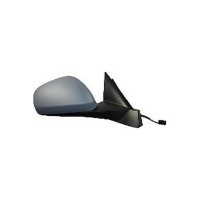 Complete replacement electric adjust wing mirror unit with blue tinted & heated glass for the Alfa Romeo Mito - [2006 onwards] - Mirror cap cover comes finished in smooth primer - suitable for colour coding. [temp sensor in LH version]. Complete replacement power folding and electric adjust wing mirror unit with blue tinted & heated glass for the Alfa Romeo Mito - [2006 onwards] - Mirror cap cover comes finished in smooth primer - suitable for colour coding. [temp sensor in LH version].